Frekhtman & Associates are Queens truck accident lawyers dedicated to preparing each case meticulously for the maximum possible award via settlement or jury trial. Statistics show that one in eight car accidents with a tractor trailer or truck end in wrongful death. Trucks can cause catastrophic damage and injuries due to their gigantic size and weight even at relatively slow speeds. An experienced Queens truck accident lawyer will work with safety experts to help establish liability. Truck safety engineering experts will go to the accident scene and take photographs and measurements. Visitors to New York City quickly learn that Queens is the largest of the metropolitan area’s boroughs and home to two of its largest airports, as well as many popular sports and entertainment venues. Countless cars, trucks and buses move through the area daily, often leading to major accidents. Given the address presence of motorcyclists, pedestrians and bicyclists, lawsuits based onserious injuries and wrongful death are common. Accidents on freeways and near bridges and overpasses also occur frequently. And given all the negligence of bus drivers and other distracted drivers, it’s a wonder that so many ever reach their destinations safely. All kinds of large vehicles travel these roads, including 18-wheeler trucks, tankers, and box trucks. Passenger cars often wind up totaled or badly damaged in many of these accidents. In May of 2017, a truck and a school bus collided in the Rosedale section of Queens at Rockaway and Brookville Boulevards. After one adult and sixteen children were hurt in that crash, many had to be sent to St. John’s Hospital for further medical observation. Likes so many other Queens truck accidents, this one left many victims and witnesses badly shaken. The most frequent types of truck accident injuries are set forth below, along with New York truck fatality statistics for recent years. 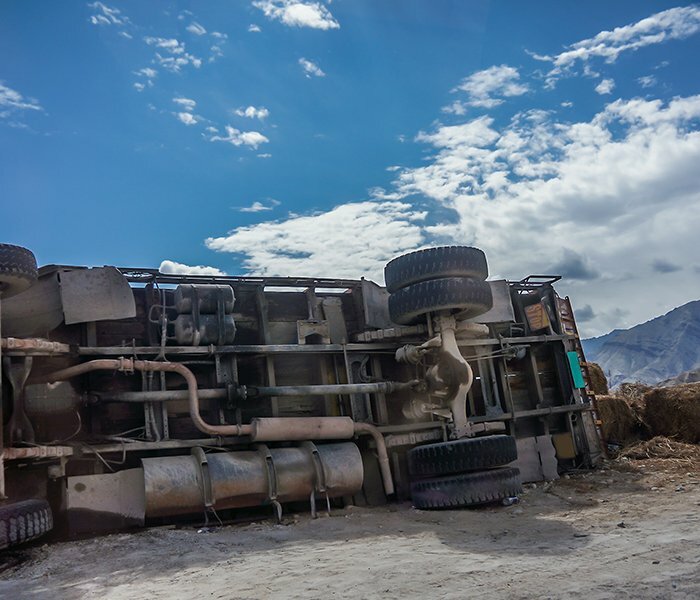 There’s additional information on the causes of many of these collisions — and the types of damages your Queens truck accident lawyers always seek to recover on each client’s behalf in these personal injury cases. Psychological damage can require long-term treatment. Survivors frequently battle nightmares, anxiety attacks and depression after suffering both temporary and permanent physical injuries in truck accidents. Coping with emotional trauma due to an accident can take many years of talking therapy to fully recover. While most of us like to assume that we’ll never personally face these types of injuries, statistics reveal that truck accidents happen quite regularly. During 2016, over one thousand people (1,029) died in New York vehicle accidents – with ninety-seven (97) of them due to large truck collisions. Since a total of 4,317 Americans died in large truck accidents that same year, those numbers indicate that New York suffers many more of these incidents than other states – although the number of vehicles traveling daily across our roads is higher than most. Upon reviewing these statistics, it’s natural to wonder what often causes drivers of large trucks to make so many serious driving errors. Here’s a look at the most frequent mistakes these truck drivers often make – leading to both serious and catastrophic accidents. Who to Sue after a Queens Truck Accident ? With respect to the Queens truck accidents that involve interstate trucking, there are mandatory insurance rules to protect the public who can be seriously injured in accidents with tractor trailers. Trucking companies that own the tractor and trailer usually have sufficient insurance of 1 million or more and with additional layers of insurance beyond the first million known as excess, umbrella, or supplemental coverage. However, in some circumstances a truck may not have insurance or there could be a dispute between insurance companies as to which of them has to cover the truck. For example, a trucking company may be operating illegally without insurance. A trucking insurance company may dispute whether the vehicle involved in the accident is a covered auto under the policy or claim the operation of said truck was a policy violation. There are many possibilities of why an insurance company may claim the policy will not cover the accident. If the truck involved in an accident is not covered under the insurance policy, then an MCS-90 endorsement provides insurance. This endorsement serves as an additional protection to the public. For more information on the MCS-90 endorsement, please download this .pdf brochure. Refusing to obey all posted traffic signs and signals. Speeding is one of the worst offenses – along with failing to slow down when navigating sharp freeway turns or travelling during bad weather. Too many truckers also practice tailgating. Given their large vehicle size, truckers must be willing to yield to many smaller cars, pedestrians and motorcyclists to increase safety. Failing to properly maintain trucks. Drivers must make sure that their side mirrors are positioned correctly and that they still have thick brake pads. Commercial trucks that need windshield replacements or that have other broken vehicle parts pose too great a hazard to other motorists. Truck Underride Accidents which occur when a car slams into the rear or side of a tractor trailer at high speed with the passenger car going underneath the trailer. These are horrific accidents which often lead to death. More information on Queens truck underride accidents can be found here. Jackknife Tractor Trailer accidents happen when a truck brakes suddenly or its wheel’s lock up causing the trailer to swing out to a 90 degree angle away from the tractor. More information on Jackknife accidents can be found here. Truck rollover accidents. 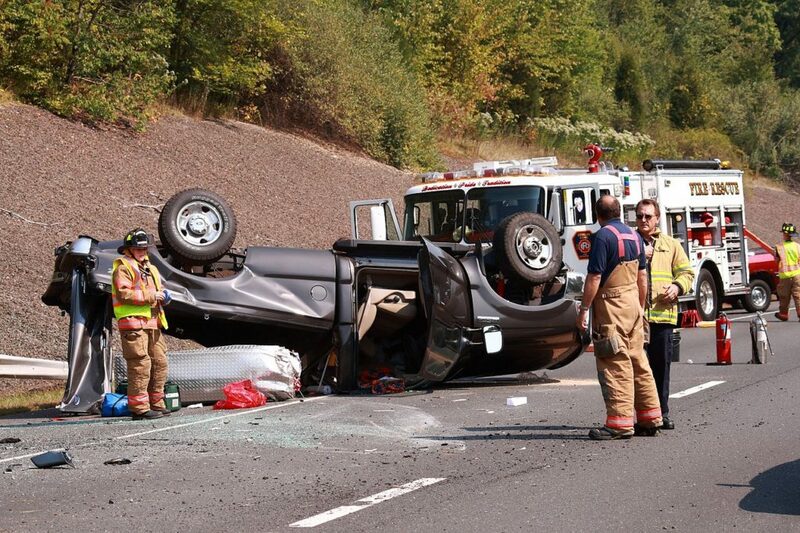 While a rollover accident can happen to a passenger car, SUV, or a truck, a rollover is more likely to happen in a vehicle that is high off the ground with a higher center of gravity. Improper Turns or Lane Changes: sometimes due to the magnitude of trucks and tractor trailers, a driver will change lanes without seeing another vehicle thereby clipping a passenger car or motorcycle. Other times a tractor trailer may be in the process of turning and take up more than one lane of vehicle traffic which can lead to an impact with a car or other vehicle. Our Queens law firm works with truck accident reconstruction and safety engineering experts will analyze the truck involved in the accident to determine if it was properly maintained and repaired. They will check the truck’s tires, brakes, and many other details. This type of complete investigation will aid the truck accident trial lawyer in proving liability when the case is scheduled for trial before a jury in Queens Supreme Court. It will also show the truck’s insurance company that this client’s attorneys are serious which will likely increase their settlement offer during negotiations or at a mediation. Pain & Suffering including medically diagnosed injuries from a review of all your medical records. Our firm also helps coordinate your medical care ensuring you see the right medical specialists for your symptoms of pain and obtain the correct treatment and diagnosis. This allows you to heal from your injuries and enables maximum compensation for all your injuries. The Queens truck accident lawyers at Frekhtman & Associates serve the following Queens neighborhoods: Astoria, Ditmars, Long Island City, Hunters Point, Sunnyside, Woodside, Bayside, Bellerose, College Point, Flushing, Douglaston, Kew Gardens, Floral Park, Fresh Meadows, Little Neck, Whitestone, Corona, Maspeth, Middle Village, Rego Park, Forest Hills, Ridgewood, Wyckoff Heights, Cambria Heights, Jamaica, Hollis, Laurelton, Queens Village, Rosedale, Saint Albans, Springfield Gardens, South Jamaica, Warnerville, Howard Beach, Ozone Park, Richmond Hill, Woodhaven, the Rockaways, and others. If you or someone you know needs a Queens truck accident lawyer, please call our office at (212) 222-1111 or toll free at (866) ATTY-LAW. You’ll be quickly connected with our law firm. Should you prefer, you can first fill out our firm’s online general information form and request a phone call. We look forward to speaking with you soon.